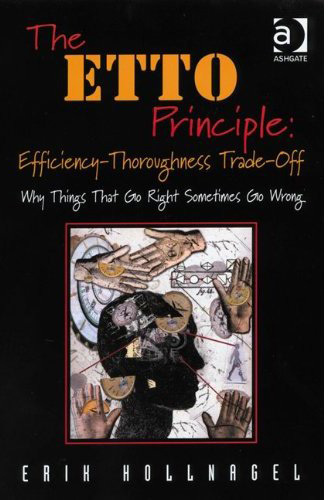 In his book, Erik Hollnagel provides us with a few fundamentals that govern the ETTO principle, these are the « ETTO rules », applicable to the working environment, that demonstrate that trade-off is more naturally leaning toward efficiency rather than toward safety ; as, in our own lives, the accident remain the exception and success an overarching rule. These rules can be well summarized and illustrated by sentences such as « it looks good », « that’s not important », « there is no need to double-check, it should be fine as-is », « it’s good enough », « its is faster doing this way », « there is no time doing this », « this will be cross-checked by the next person in the loop », « this has been already checked », « usually, it works », « it looks like …, so it must work as … », « do not overdo », « this needs to be completed », « we need to be on time », « if you don’t say anything, I will not speak up », « I’m not the expert, this is your decision ». There is also trade-offs of the ETTO type in organizations, one of the most interesting example for us in aviation is the frequent contradiction that may be observed between an explicit « safety first » policy and the actual underlying priority given by the organization to productivity. Based on the analysis of aviation accidents, Erik Hollnagel takes examples to highlight that accident investigations reveal unambiguously that actors have acted differently from what they were expected to do. Could have they done otherwise ? Actually not really, since if people do ETTO’s this is simply because it is an efficient strategy, that is absolutely required under the circumstances. If all rules are applied by-the-book, nothing works, … and this does not enhance safety, this is largely demonstrated when a trade community goes on strike on a work-to-rule basis. Admittedly, absolute safety cannot be achieved : what should be the speed limit to prevent any personal injury in road accidents, 20 mph ? 10 mph ? » criminalized » in order to assign responsibility. This is a debatable objective, it would be certainly advisable to rather look into daily practices and identifies what makes the system to be up and running. Indeed, if » success and failure have the same origin, only the outcome makes the difference » ( Ernst Mach ). Likewise, the accident is the most visible side of a coin named activity. Things may go wrong for the same reasons that they could go right, this is only the transient nature of things or the adverse stack-up of unexpected conditions that lead to undesired outcomes. In a nutshell, almost any activity requires to adjust performance, through ETTO’s, as only a fully controlled environment – as in military parades – allows to work strictly in accordance with pre-established rules / procedures. Most activities cannot be fully laid out as they are subject to interruptions, to disturbing external factors / distractions, and to time pressure. Such activities can hardly be fully covered by published procedures. During the approach checklist, the controller assigns a given heading and airspeed; the flight crew interrupts the checklist, performs the necessary entries and resumes the checklist at the step where it was interrupted ( an ETTO toward efficiency dictated by time pressure, followed by an ETTO toward thoroughness ). ( paraphrasing Mr Colin, in his benchmark report on flight safety ). Pilots have the educated ability to adapt the published framework and make sound tradeoffs between efficiency and safety. As line pilots, but also as instructors or check airmen, let’s aim at a satisfactory level of global performance, hence at maintaining the desired level of safety, rather than striving at a perfect performance in each and every detail. Let’s be thorough where and when it most matters, whenever the trade-off must enhance operating safety for obvious reasons and when thoroughness is truly needed. Let’s be and remain aware that timely anticipation and margins are most needed to mitigate the adverse combination of hazardous / unexpected / undesired conditions … in a nutshell, to mitigate rogue waves. 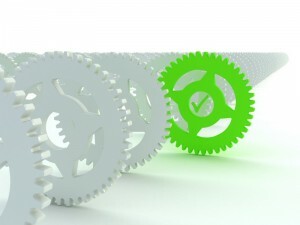 We need to implement safety management systems ( SMS ) that effectively capture the lessons-learned from past events, not only at our level as front-line operators but also in enhancing training and company organization whenever necessary, thus protecting today’s operating safety in order to guarantee tomorrow’s efficiency. Erik Hollnagel refers to such a process as a double-loop learning process whereby objectives must not be frozen but must be adapted as a function of achievements ; this is what the concept of proactive safety is all about.